And here is the Playlist on YouTube with several performances from that amazing evening! Other Voices NYC, charts the journey of Other Voices from its home on the Dingle Peninsula across the Atlantic to the heart of the East Village in New York City featuring Gabriel Byrne, Glen Hansard, Roddy Doyle, Damien Rice and Joseph O’Connor amongst many others. Here is the posting from Jacob Blickenstaff, the photographer who provided most of the very cool pictures we have been enjoying! Ok. Ok. I lied. Here is something else, this time from our friends at Irish Central and oh look! They used the image mash-up I made for this site. Cool! 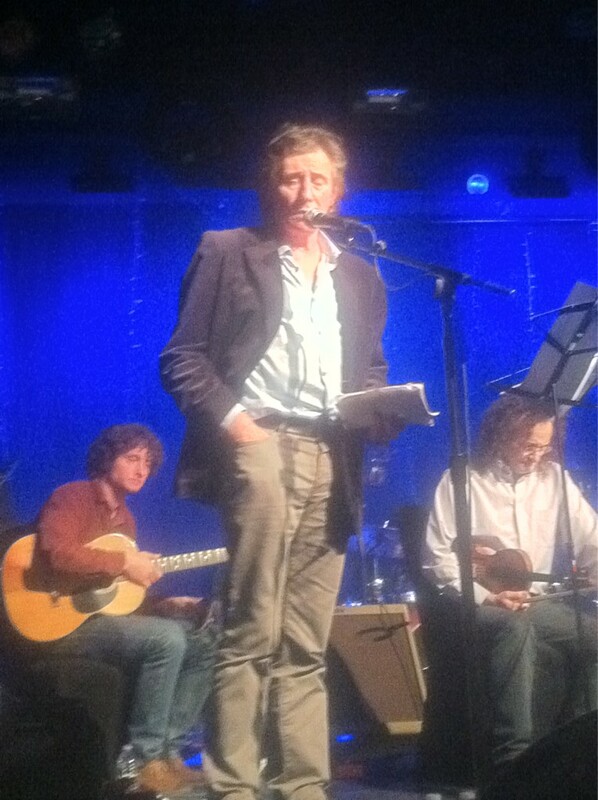 The Thursday night show squeezed in 400 people in the large subterranean room with only about half that number able to secure seats for what turned into a masterful and varied three and half hour show, nimbly mixing the musical talent with the giants of Irish literature taking part like Paul Muldoon, Joseph O’Connor and Colum McCann. The New York Times review of the event has surfaced! Last week “Other Voices,” an Irish television program that films musical performances in the 200-year-old St. James Church in Dingle, Ireland, took up residence at Le Poisson Rouge in Greenwich Village. ‘Other Voices’ came to New York to celebrate 10 years of enticing musicians, including Amy Winehouse, Billy Bragg and the National, to make their ways to County Kerry to join local musicians for intimate sets and unexpected mash-ups of the ancient and modern. 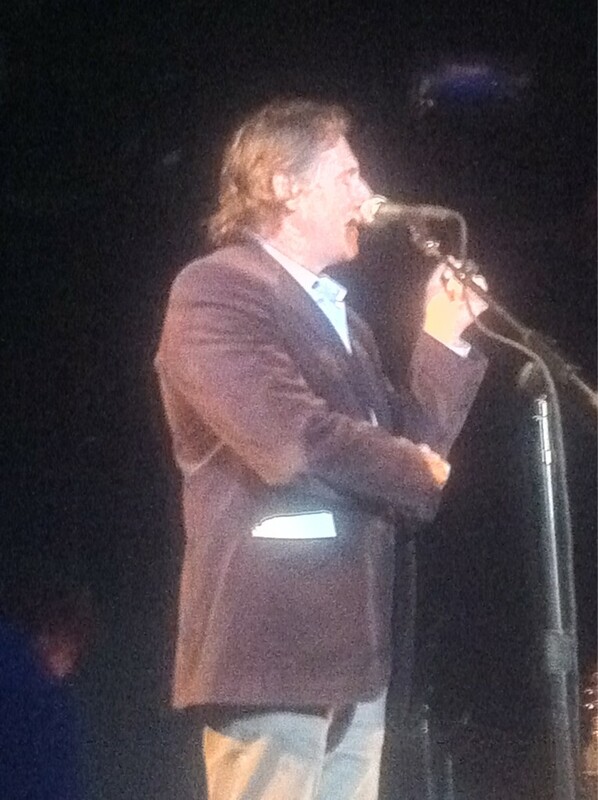 The actor Gabriel Byrne read a poem by Yeats. He also serves as the cultural ambassador for Ireland, an unpaid position in which he works with Imagine Ireland, part of a governmental effort to export Irish culture. After the event, Mr. [Colum] McCann, the Irish-born author of “Let the Great World Spin,” who read one of his early short stories from the stage, tried to explain why a music series from a tiny town in coastal Ireland looked so at home in New York. Like a lot of the performers, Mr. McCann pointed to the election held in Ireland that day, in which Michael D. Higgins, a poet, beat a businessman, among others, to become the president. Thanks to Lost Lily for finding this review and providing the link! Captured on film by RTÉ and US national broadcaster NPR, previewed in Vogue and reviewed in the New York Times , it was a night to remember. “If you didn’t have a photo of this, nobody would believe that it had happened,” said one of the organisers Philip King. Yay! Really happy to hear about the filming! And I am not finding a review in the New York Times, so if you see one, let me know. 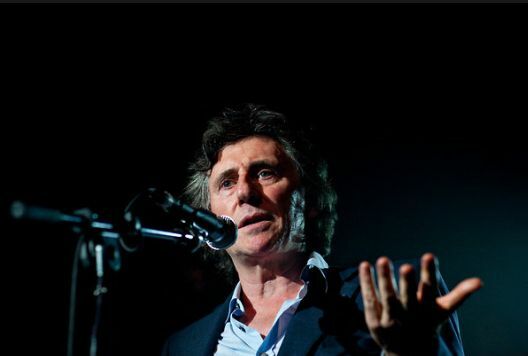 “We don’t know where we’re going, we don’t know where we’ll be when we get there, and when we get back we probably won’t know where we’ve been, so join us on this journey this evening,” said Irish actor/writer Gabriel Byrne effectively introducing the event’s pleasantly discursive nature. What unfolded over the course of the next three-and-a-half hours was a hearty round of poetry, prose, and music, much in the spirit of Doveman’s monthly series, the Burgundy Stain Sessions. Acclaimed Irish music series Other Voices marked its 10-year anniversary last night with the first of two sold-out shows at New York’s Le Poisson Rouge. The star-studded lineup of Irish and American musicians and writers, which included Glen Hansard (The Swell Season), Bryce and Aaron Dessner (The National), Bell X1, Martha Wainwright, actor/director Gabriel Byrne, Pulitzer Prize-winning poet Paul Muldoon, Booker Prize-winning author Roddy Doyle, and many others, also featured several surprise guests including Justin Bond, Sharon Van Etten, Trixie Whitley and Damien Rice making a rare live appearance. Curated by Glen Hansard, Thomas Bartlett, and Other Voices series editor Philip King, the concert was the first Other Voices event in America and featured performances ranging from traditional Irish fiddle tunes and poetry readings to rock and roll and spoken word. 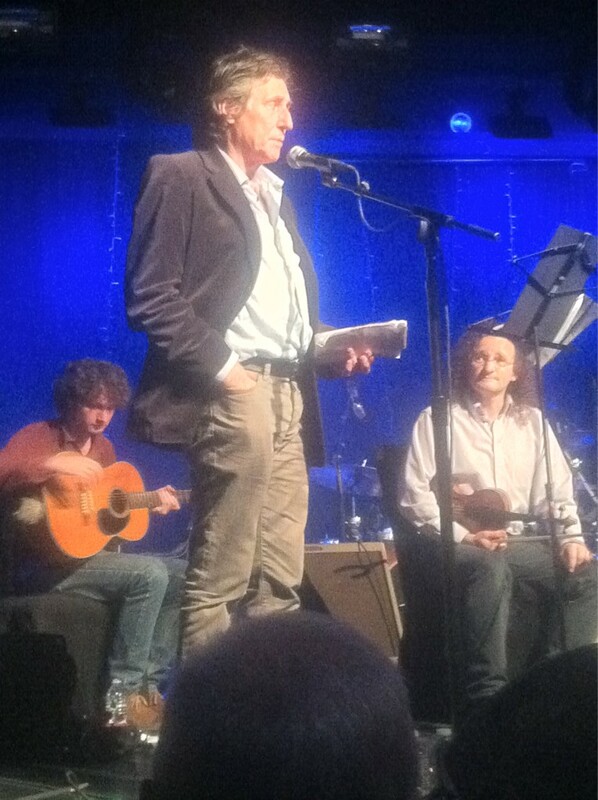 Hansard followed a new Paul Muldoon poem about Bob Dylan with a cover of “When I Paint My Masterpiece”; Gabriel Byrne recounted his early days as a struggling actor; Sam Amidon joined Martha Wainwright for a stirring performance of her mother Kate McGarrigle’s “Talk To Me Of Mendicino”; and the Dessner brothers performed a haunting instrumental guitar duo before inviting Sharon Van Etten to the stage to premiere a new song. Check the Gallery for more pictures from the event. Thanks to Det. Logan for finding these great pics for us! 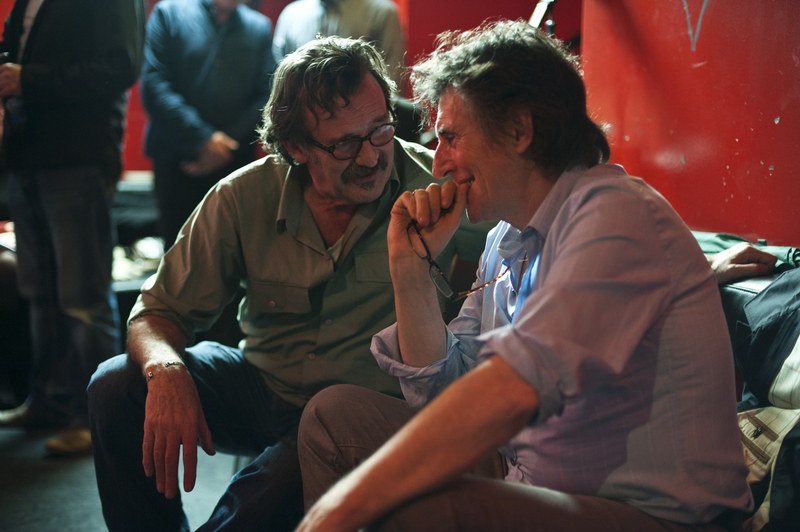 New York Irish Arts (whom we thank profusely!) did some onsite tweeting last night and provided photos. The venue was jam-packed with people, apparently, and it looks like there was standing room only. Gabriel read something, but no details on what yet. Stay tuned! Ok, according to Lozzie on Twitter: @Byrneholics I understand he read from Pictures In My Head, from ‘Hadn’t We The Gaiety!’ And that he wore red socks. And now, New York Irish Arts reports that they were videotaping madly at this event, so stay tuned for that! Be sure to read the entire posting at the New York Irish Arts Blog [unfortunately, this blog no longer exists] where they provide the latest on this great event. How It’s Irish: Just look at the bill: great rock music from Thomas Bartlett, Bell XI, great trad from Martin Hayes, Iarla Ó Lionáird, Caoimhín Ó Raghallaigh. For starters! 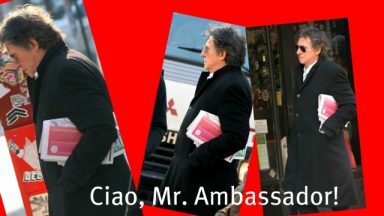 And we know Gabriel Byrne will be there, too. We think he will be reading something. Or possibly just saying hello and welcome. Singing is a remote possibility. 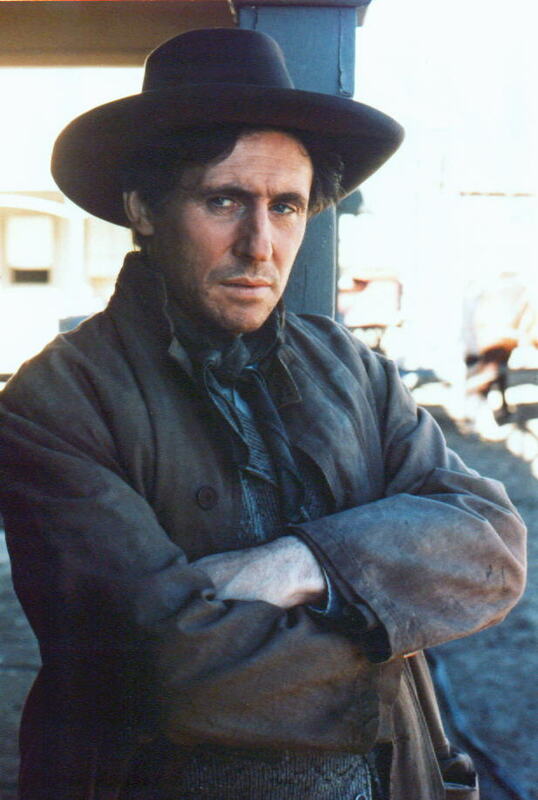 So is rounding everyone up…(see Byrne picture below). If you are in New York, Be There or Be Square! And if you are there, send us pics! What a line-up at this event! 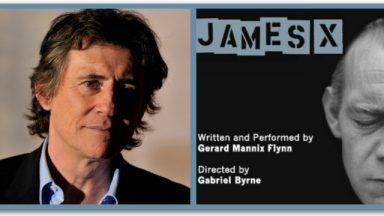 This is the kind of cultural sharing Cultural Ambassador for Ireland Gabriel Byrne and the Imagine Ireland program have been talking about. Lots of text here but give it a read. Exhilarating! 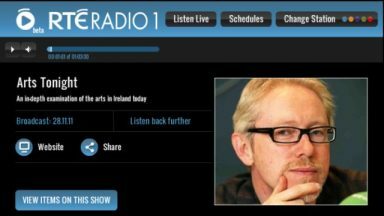 w/ Glen Hansard (The Swell Season), Bryce & Aaron Dessner (The National), Doveman, Sam Amidon, Bell X1, Iarla Ó Lionáird, Caoimhín Ó Raghallaigh, Martin Hayes, Joseph O’Connor, Colum McCann, Roddy Doyle, Martha Wainwright, Paul Muldoon, The Lost Brothers, Gabriel Byrne, and Jape. 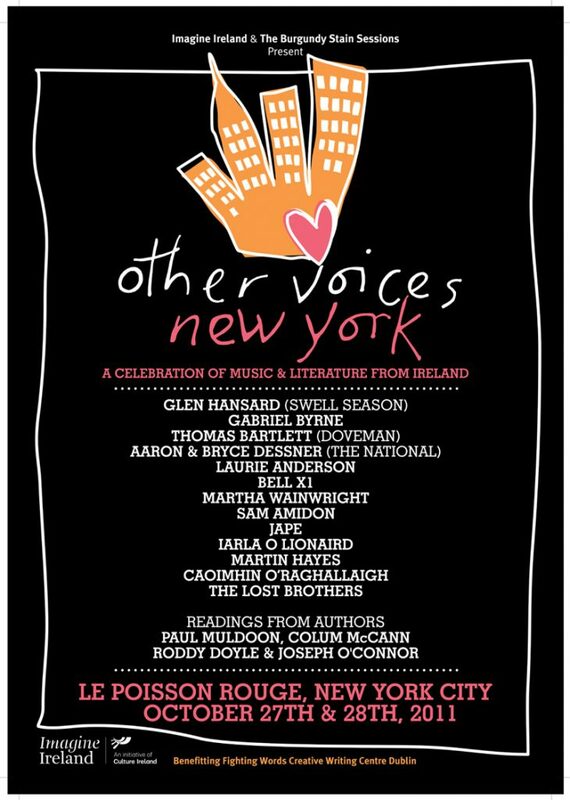 Other Voices, the internationally acclaimed music series from Ireland, crosses the Atlantic this fall for a special two-night celebration of music and literature at New York’s Le Poisson Rouge on October 27th and 28th. Other Voices NYC is presented by Imagine Ireland in association with The Burgundy Stain Sessions and will feature performances by Oscar winning Irish artist Glen Hansard (The Swell Season), Bryce & Aaron Dessner (The National), Thomas Bartlett, Sam Amidon, Bell X1, Iarla O’ Lionaird, Caoimhín Ó Raghallaigh, Martin Hayes and many more to be announced. In addition to the musical offerings, prominent Irish literary figures including Joseph O’Connor and Colum McCann will perform intimate readings during the two-day event. All sales will benefit the Fighting Words creative writing centre. Other Voices NYC is part of Culture Ireland’s “Imagine Ireland” program, a year-long celebration of Irish arts in America, funded by the Department of Tourism, Culture and Sport. This is a general admission event. Seating is limited and available on a first come, first seated basis. There is a two item minimum per person at all tables. Standing room is also available. We recommend arriving early. LPR offers a membership program that guarantees members seating for future shows. And here is even more about the individual artists [Please note: Le Poisson Rouge only has one page of information about this event available, as of February 2015]. You can watch YouTube and Vimeo videos of the performers and learn more about the Other Voices music series. There is also a great interview with Colum McCann. Be sure to check out the entry for Gabriel–it is down at the bottom of the page. I think they should consider updating it, don’t you?? And the picture they chose! I love it. Visit their website and check out their latest album, “Ocean of Frequency,” just released in September. Other Voices NYC, which is presented by Imagine Ireland in association with The Burgundy Stain Sessions, will feature musical performances, readings, and never-before-seen collaborations honoring the connections between Irish and American music and literature. Tickets are $35. All sales will benefit the Fighting Words creative writing centre. This is an Imagine Ireland event and Mr. Byrne is probably attending in his capacity as Cultural Ambassador, but you never know. Maybe he will sing or something! Check out the venue at Le Poisson Rouge. Irish Central has a related article: The Lost Brothers – lost in the music. The Fighting Words Creative Writing Center is in Dublin, Ireland and also on the web. And you can read more about Other Voices Ireland at their website, which includes lots of video from past seasons. The Irish can be proud of all the talented artists they have!